General Motors canceled an ad about real people after getting questions about legitimacy from an automotive journalist and its competitors. (WXYZ) — Chevy spent big bucks running a full one-minute ad on the Golden Globes, NFL Football and other prime time TV shows touting Chevy as the most reliable brand. But the competitors portrayed in the ad, Honda, Ford and Toyota were watching along with their attorneys. The ad is now off the air. 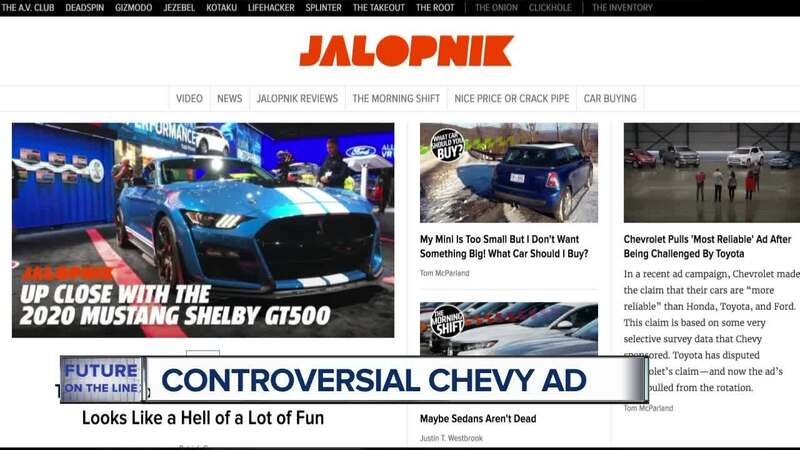 A writer for the automotive news and opinion website Jalopnik was also watching and tried to drill down to get the facts. Just two days ago, Toyota put out a statement saying the reliability claim is based on a single, limited survey commissioned by Chevy itself, not a reliable third party. The suits from the competitors also got involved pressuring Chevy. Chevrolet stands by the reliability claim and the ad remains in the brand’s toolbox but we have decided to take it out of the regular rotation at this time to launch new Silverado creative. We have not altered our marketing campaign because of any concerns with the accuracy of our ad content.